Dutch media criticized Peruvian police for placing van der Sloot in front of television cameras. Dutch paper Trouw says van der Sloot case risks becoming a "show trial"
(CNN) -- Dutch media expressed concern Tuesday about the prospects of Joran van der Sloot getting a fair trial following his arrest in Peru over the death of a 21-year-old woman. Peruvian authorities say that Van der Sloot has already confessed to killing Stephany Flores Ramirez and could be charged on Tuesday. If convicted of murder he could face up to 35 years in jail. The case has attracted international attention because van der Sloot was twice arrested and released in connection with the disappearance of American teenager Natalee Holloway in Aruba in 2005. In a comment piece published on Tuesday morning before the alleged confession, Dutch newspaper Trouw warned that police and authorities in Peru were under "overwhelming pressure" from the media to condemn van der Sloot, as soon as possible, warning that his presumed guilt appeared to be a "foregone conclusion" which risked turning his case into a "show trial." It also criticized the "openness" of the Peruvian police in placing van der Sloot in front of television cameras wearing a bulletproof vest, warning that it could compromise the case against the suspect. "Showing the suspect as a trophy could seriously harm the investigation. It could influence witnesses before they are heard," said Trouw. Trouw also criticized Dutch forensic psychology professor Corine de Ruiter who speculated in another Dutch newspaper, De Volkskrant, that van der Sloot displayed "all the major features of a classic psychopath." De Ruiter has not met van der Sloot and told De Volkskrant her suggestion that he may have a psychopathic disorder was based on analysis of "books, images and interviews" concerning the case. She cited an interview he gave on Dutch television in 2008 following which he threw a glass of wine into the face of crime reporter Peter R. de Vries. Psychopathic personality disorder is a chronic mental illness also known as antisocial personality disorder. Those with the condition "typically have no regard for right and wrong" and may be prone to violent behavior, according to MayoClinic.com. De Ruiter told the newspaper that typical psychopathic characteristics included a lack of empathy and guilt, manipulative tendencies, pathological lying and narcissism. "Psychopaths have a certain flair. They have wit, and they can also be very charming and polite," de Ruiter said. But Trouw, in the opinion piece published before van der Sloot's alleged confession, said: "What if he is still proven innocent? On closer inspection, the 22-year-old Dutchman is just a suspect in an 'ordinary' murder investigation. So he must be treated. Until the court has sentenced, after thorough deliberation." That sentiment was echoed by the Web site of the English language Radio Netherlands Worldwide which voiced concerns about the amount of possible evidence which had already been made public. 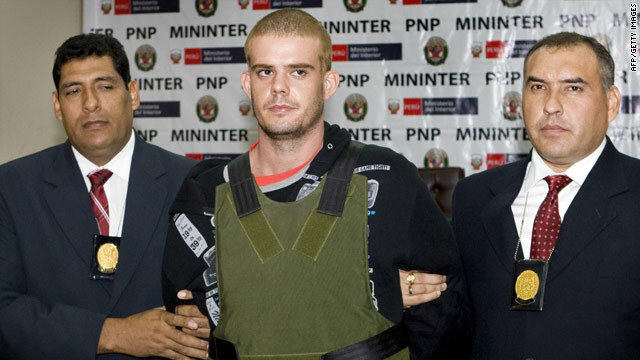 It noted that van der Sloot was "already a well-known figure in the United States, the Netherlands and in Aruba." "Generally, the Netherlands never interferes with legal processes in other countries, but there may well be reason to protest in this case," it said. Radio Netherlands Worldwide said van der Sloot's alleged confession over the killing of Flores was a "surprise" as van der Sloot had previosly refused to say anything about his alleged involvement. "For Peru, Joran van der Sloot is principally a matter of prestige," the Web site said. "His rights and privacy are secondary to the country's desire to show off to the world with its handling of the Stephany Flores murder case." Matthijs Spits in Amsterdam contributed to this story.